All flights arrive and depart from Guatemala City. Plan to land at a reasonable hour of the day prior to your tour start date. Most flights arrive in the late afternoon and evening. In some cases, it may mean spending one night in a Guatemala City hotel. Keep in mind, we are ready to pick you up at the La Aurora International airport on day one of the trip itinerary, but also available to pick you up from your hotel. You’ll meet your bike guides once settled in Antigua. We will shuttle you back to Guatemala City on the last day of the tour. We will likely be arriving at the airport throughout the day. Therefore, we would advise booking your flights home no earlier than 8 AM. If your departure flights differ from this, we would be happy to help book you into an airport hotel overnight, if needed. Guatemala City is served by several major airlines from all over the world. For up-to-date timetables and booking visit: www.ba.com; www.aa.com; www.united.com; and www.delta.com. We encourage you to book your bike on to your flight in advance, otherwise you could experience an unexpected charges or delays at the airport. Each airline handles the checking-in of a bicycling differently, make sure you know their requirements. Please carefully read through the full travel kit list before you start planning a mountain biking adventure in Guatemala. You will want to make sure you have everything needed before arriving in country. This adventure in Guatemala is for intermediate to expert riders with a reasonably strong fitness level. The pace on our rides are based on the group, but expect to be challenged. Both the terrain and fellow cyclists will serve as inspiration throughout the week. The best option for a bike is a good quality full-suspension mountain bike with around 120mm of travel in front and rear. To prepare for your mountain biking adventure in Guatemala you should be in proper riding condition in advance of the trip. It’s highly recommended that you bring your own bike. Please be sure it has been properly serviced before the trip. We can arrange a bike rental for you and have it ready for your arrival. With that being said, we strongly encourage clients to travel with their own bike. Riding the bike you know will likely add to the riding experience. 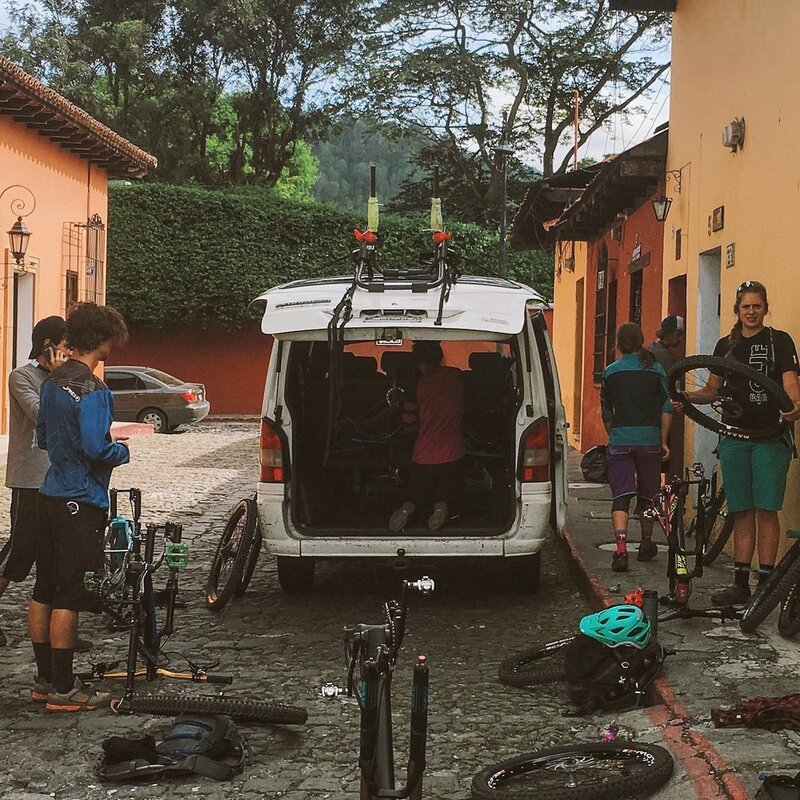 One of the things that sets our mountain bike adventure trips in Central America is our flexibility to include lodging and meals, or allow you to make your own plans. We understand clients want to stay in a clean and safe hotel, located close to city attractions. This is why we are based in Antigua. Each client will have a variety of budget friendly lodging choices and a number of food and drink establishments to check out. If you prefer, we can offer inclusive lodging and food packages. We work with friendly and trail knowledgeable mountain bike guides. They are qualified and well versed with the cycling terrain you will encounter in Central America. Our guides have years of experience riding the trails of Guatemala and are insightful when it comes to local history, plants, and animals. They are there to make sure that everyone in the group is taken care of and has a great time. Travel in Guatemala does not require vaccinations, however some online resources like MD Travel Health can provide a list of suggested precautions. We recommend drinking the bottled or filtered water throughout the trip. It’s also very important to note that there are no US government security warnings for Guatemala. But, crime is reported often in various parts of the country. However, in a place like Antigua, where tourism is vital to the economy, a strong police presence ensures common crimes like theft and robbery are limited. Backshop provides accommodations that are safe and secure and we work with local partners to make sure you and your bike are in safe hands. The official currency of Guatemala is the Quetzal. US Dollars are also accepted in some larger establishments. ATM machines are easily accessible throughout Guatemala. You should have no problems with getting enough cash to see you through the week. Credit and debit cards are widely accepted in Antigua, with more limited or no use in rural areas of the country. It is not compulsory to tip your guides or drivers in Guatemala but you can tip at your own discretion if you feel a degree of service merits it. It is not necessary to tip in restaurants, a 10% surcharge on your bill goes to your server. Therefore you are not required to leave an additional tip. US, Canadian, British, Australian and European Citizens do not require visas to visit Guatemala. You must have your passport as proof of citizenship. We will ask you to send us a copy of your passport for our file in case of emergency. While we don’t require travel insurance for our mountain bike tours as a condition of booking, we highly recommend considering travel insurance against medical and personal accident risks. In this policy you will want to include coverage for mountain biking and it is highly recommended that you take out a policy which covers cancellation and baggage. If you’re looking for travel insurance we suggest looking at Global Rescue. They offer policies specially designed for mountain bike enthusiasts. You can get insurance coverage directly with them and then share with us your policy details. Spanish is the national language of Guatemala and spoken by the majority of citizens. There are several indigenous Mayan languages used by some, and English is fast becoming commonly spoken by many locals. Still, it should not be assumed that everyone understands or speaks it. If you have trouble communicating with anyone, please ask us for assistance. Keep in mind that comforts you are accustomed at home may not be available to you, and the concept of time is different. For example, you can’t flush toilet paper and must instead dispose of it in the trash. Exercising patience and respect are advisable to help ensure you having a rewarding trip. The Antigua valley can get chilly at night so you SHOULD bring warm clothing on the trip, like a sweatshirt or light jacket. Also, we have planned some early morning departures. So, it can likely be cooler temps during these times. The rainy season in Guatemala extends from June to late October, so come prepared with rain gear for the heavy afternoon showers in October. Average temperatures range between 25°C/77°F (High) and 13°C/56°F (Low) during April/May and October/November.